Pokemon Movie Wants a Big Action Star as Detective Pikachu? Don't get too excited just yet Pokemon fans, but it looks like Legendary Pictures has their eyes on some pretty big names to play the titular character in the upcoming Detective Pikachu movie. This is going to be the first ever live-action Pokemon movie and that's a big deal. So why not go for a big star? And who's bigger than The Rock? Probably nobody and, according to a new rumor, he's one of several A-list actors being considered to voice Pikachu in the movie. We need to caution that before we even list the rest of these names, this should merely be regarded as rumor for right now. 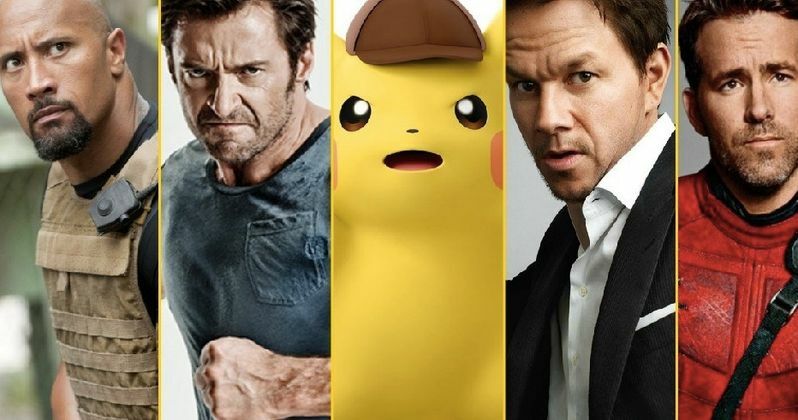 There's no evidence that any of these actors have had any meetings with the studio about Detective Pikachu, but they are said to be on the studio's "wish list" for the movie. That said, in addition to Dwayne "The Rock" Johnson, the other names include Hugh Jackman, Ryan Reynolds and Mark Wahlberg. None of which would come to mind when someone thinks of Pikachu, but that seems to be what the creative team is going for. No synopsis for Detective Pikachu has been revealed yet, but the movie is to be based on the video game of the same name. The game follows a talking Pikachu who isn't as powerful or physically gifted as other Pikachu are, like the one who accompanies Ash in the animated shows and movies. He is, however, intelligent and claims to be a great detective. In the game, this Pikachu encounters a boy named Tim Goodman, who is able to understand what he's saying. The two then begin working together to solve various mysteries in the city, all involving Pokemon. Looking at guys like Dwayne Johnson, who seems a little too busy for something like this at the moment, and Hugh Jackman makes it seem like they are going to play up some comedy by having Pikachu be quite a bit different than fans may expect. That could make Detective Pikachu a much more comedic movie than we may have previously thought. As for how likely any of these rumored actors are? There's no reason Ryan Reynolds or Mark Wahlberg couldn't do it. It seems like a peculiarly perfect thing for Reynolds, but getting The Rock or Jackman seems like a bit of a pipedream. Detective Pikachu was written by Alex Hirsch (Gravity Falls) and Nicole Perlman (Guardians of the Galaxy) with Rob Letterman (Goosebumps) set to direct. The movie is expected to go into production in January, so they'll have to nail casting down soon. That Hashtag Show's report doesn't make any note of a release date, but with production starting soon, Legendary Pictures will probably make some sort of formal announcement soon. In any case, this new rumored casting list definitely makes Detective Pikachu seem like a much more interesting movie than it did prior to today.